If pressed to answer questions like “What is love? What is lust? Is there a precise moment when they independently intertwine, or does one necessarily lead to the other?” I wouldn’t know what to say. I wouldn’t be able to fully articulate my answers to such questions. Words wouldn’t be and could never be enough. So, instead of attempting to answer these questions, I’d just play this video for the inquisitor. I’d hope that they would understand. I’d want them to see what I do: that the answers to each of these questions can be found in these 3 minutes and 15 seconds of cinematic perfection from Jean-Luc Godard‘s Alphaville, a French dystopian science fiction film. This is love. This is desire. This is the beautiful and terrifying moment when the two intertwine. This says it all in a way that words alone never could. Your voice, your eyes, your hands, your lips… Our silences, our words… Light that goes, light that returns. A single smile between us. In quest of knowledge, I watched night create day while we seemed unchanged. O beloved all, beloved of one alone, your mouth silently promised to be happy. Away, away says hate; Closer, closer says love. A caress leads us from our infancy. Increasingly I see the human form as a lovers’ dialogue. The heart has but one mouth. Everything by chance. All words without thought. Sentiments adrift. Men roam the city. A glance, a word. Because I love you, everything moves. We must advance to live. Aim straight ahead towards those you love. I went toward you, endlessly toward the light. If you smile, it enfolds me all the better. The rays of your arms pierce the mist. Thanks so much for posting this! I really enjoyed being on the panel (I’m the girl in the middle) & am so grateful for the opportunity. I do think that there should have been two separate panels, though. In the months leading up to this, I’d been (based on conversations with a few of the others) envisioning and preparing for a discussion of how the skills that we (active skeptics who are also teachers/scholars of various humanities disciplines (rhetoric/composition, in my case)) study and/or teach (i.e. the importance of thinking critically, of research, of supporting our assertions with legitimate (i.e. not anecdotal or personal) evidence from quality sources, of expressing ourselves in the clearest possible manner, of analyzing and critiquing all assertions, including our own, of practicing the principle of charity, etc.) can and should become a part of every skeptical activist’s “skeptic’s toolkit” (for lack of a better phrase). That kind of discussion would have been much more relevant to TAM, as it would have stayed focused on scientific skepticism/skeptical inquiry, skepticism as a methodology, and skills-based skepticism. The humanities fall within the scope of scientific skepticism and are relevant to the methodology of skepticism *only* when the humanities can provide pragmatic tools, thought processes, and skills that all skeptics can put to use. That’s the only justification for including the humanities in a conference like TAM, and I think that a humanities-only panel would have been able to have the kind of productive, pragmatic, and interesting discussion that I outlined above. Honestly, when I found out that it was going to be an arts *and* humanities panel (this was a few months after initial planning and discussion began), I was a bit frustrated/disappointed, as I knew that the type of panel I’d been envisioning and preparing for wasn’t going to be happening, and I had no clue as to how we were going to include two very different fields/subjects in one discussion, let alone keep that discussion relevant to skeptical activism and within the scope of scientific skepticism/skeptical inquiry. The arts are relevant to skepticism in their own way, and a separate panel on that topic would have been interesting, I’m sure. But meshing the arts and the humanities together like this just didn’t work all that well. I still think that the panel was good, and that some valuable points were made and that some important discussion occurred, but I kept wanting to return the focus to the pragmatic skills and topics that I mentioned above, and that didn’t happen nearly enough, unfortunately. 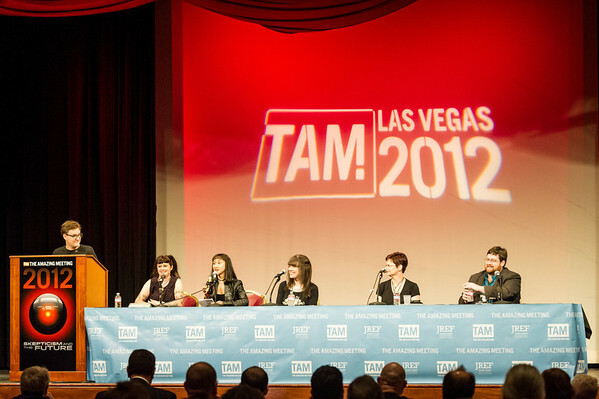 Nevertheless, I am *so* grateful to have had the opportunity to take part in a panel, I loved being a part of TAM (it was seriously amazing and wonderful and so lovely ♥), and would love to be involved again next year. And, again, thanks so much to the JREF for filming and posting these talks and panels. They’re a great resource for both educators and for the skeptical community as a whole. Hi there! After my previous post (“SkeptiCamp Denver & ‘Pragmatic Rhetoric for Idealistic Skeptics’”), a few people emailed to ask me if, instead of embedding the video of the entire day, I could embed my talk as a separate video. And, although it was tricky, I think that this should work. If it doesn’t work, please do let me know. Also, thanks again to Michael Clifton for filming the entire day and for making the video available for reuse via a Creative Commons license.